Our Mantova post style shelving is available in a range of sizes. 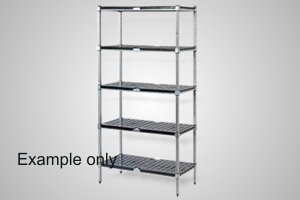 Easy to assemble with adjustable shelf positions, the shelves are constructed of perforated ABS black plastic for air circulation and easy cleaning. Perfect for use in coolrooms or dry storage, the shelving also features bullet feet for levelling.